Why is Spectinomycin not available in the US? Pfizer discontinued US distribution of spectinomycin (Trobicin®) in November 2005; remaining inventory expired in May 2006 . Nonetheless, at the FDA website we still find a Package Insert for Trobicin updated as late as Aug 2012, a thin 6-page leaflet which seems to have survived from the 80s. The drug is on the WHO List of Essential Medicines  for the indications of uncomplicated anogenital and disseminated GC infection, so we should know a bit about it. Spectinomycin is indicated as a 2 g or 4 g IM injection; the breakpoint for GC is 64 mg/L. In the Adverse Event section, we find soreness at the injection site but not much else. Yes, you read it right: this aminocyclitol is different from all others. First, it does not have the aminoglycoside characteristics of renal, nephro- and ototoxicity ,. Second, while other aminoglycosides have a Class C or D pregnancy listing, spectinomycin sports a ‘safe to use’ Class B label. 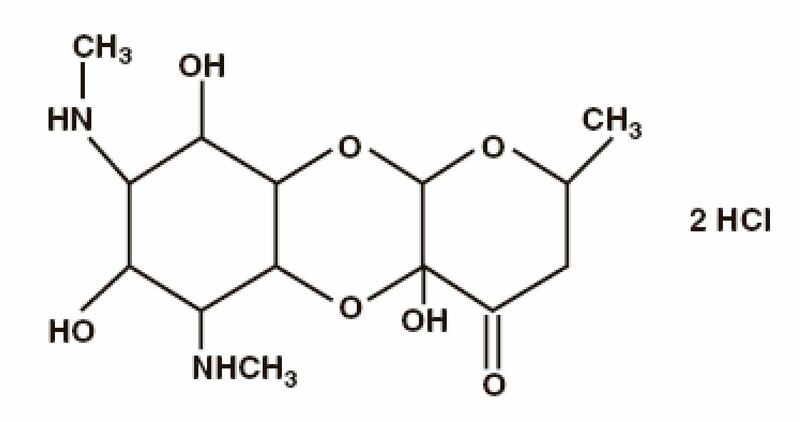 The chemical structure is certainly not reminiscent of a streptomycin or plazomicin, a difference even evident to the eyes of non-chemists. Modern literature on spectinomycin is hard to come by. 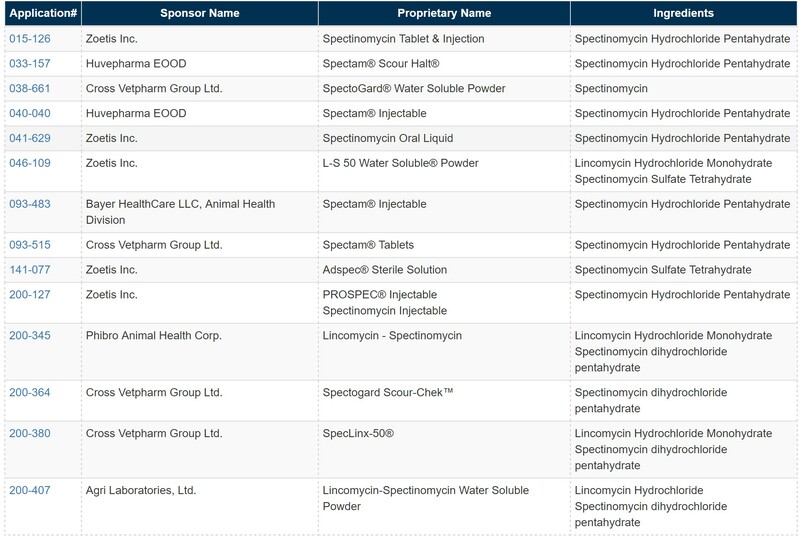 Without a sponsor, the drug is rarely investigated and there is no monograph devoted to spectinomycin since the 80s. Textbooks of infectious diseases still mention the drug, almost as an afterthought . We are grateful for the reviews on chemistry, microbiology and pharmacology in Bryskier’s textbook  highlighting the excellent activity of spectinomycin and its close relative, trospectomycin, against GC. The most recent CDC Treatment Guidelines for STD still list spectinomycin as an alternative drug for urogenital and anogenital GC. The document makes mention of an often-quoted GC study from 1995 in which spectinomycin treatment was successful in 98% . Interestingly, in the same paragraph CDC also mentions that the drug is ‘expensive’, presumably a significant drawback. Hmm, a price tag of US$ 3-5 does not impress us as terribly expensive treatment. We certainly cannot substantiate the CDC’s ‘concern’ about the high cost of spectinomycin and have to relegate this argument to the ‘fake news’ category. After Pfizer pulled out, CDC and FDA promised efforts to “make spectinomycin available again in the US” ; unfortunately we cannot find evidence of such efforts. Okay, maybe another case of ‘fake news’ or a case of good intentions lost in follow-up. But it should be so easy: why not require that these same veterinary producers also provide batches for human use. Hey, let’s Make America Great Again! Clearly, one would prefer spectinomycin (or trospectomycin) to gentamicin, the back-up option for GC treatment proposed by CDC in the Guideline document. Why use high-dose gentamicin when we have a safer alternative in spectinomycin? CDC is obviously very impressed with its own trial in which gentamicin (240 mg IM) in conjunction with azithromycin cured 100% according to per-protocol analysis. However, when one reads the article more carefully, it becomes clear that the microITT population did not do so well: now the gentamicin arm only achieved 83.8% efficacy . Several other disclaimers apply as well; suffice it to say that the trial does not meet today’s standards for the conduct of an uncomplicated GC study. Industry would be held to higher standards. There are many such “forgotten antibiotics” like spectinomycin and the call has gone out to make them available more broadly again . We believe that all drugs on the WHO List of Essential Medicines should be available worldwide, and that includes the US. In addition, we would like to see a new trial of spectinomycin in uncomplicated GC to re-assess and confirm its usefulness for the indication. This entry was posted in The News, The Viewpoint and tagged aminocyclitol, aminoglycoside, Bayer Health Care, CDC, Cipla, FDA, forgotten antibiotics, gentamicin, Neisseria gonorrhoeae, Pfizer, plazomicin, spectinomycin, Spectram, STD Treatment Guidelines, streptomycin, treatment of GC, Trobicin, trospectomycin, uncomplicated GC, urogenital GC, veterinary use of antibiotics, WHO List of Essential Medicines by Harald. Bookmark the permalink. Next → Next post: The Letermovir Top-Line Results are Out – Or Are They?